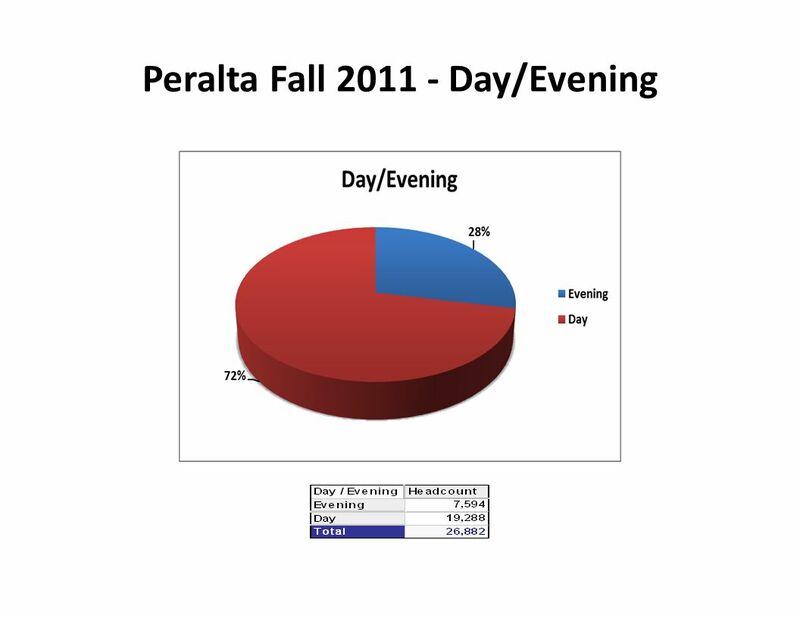 Peralta 2011 ARCC Report Mike Orkin, Ph.D. Office of Educational Services Peralta Community College District. 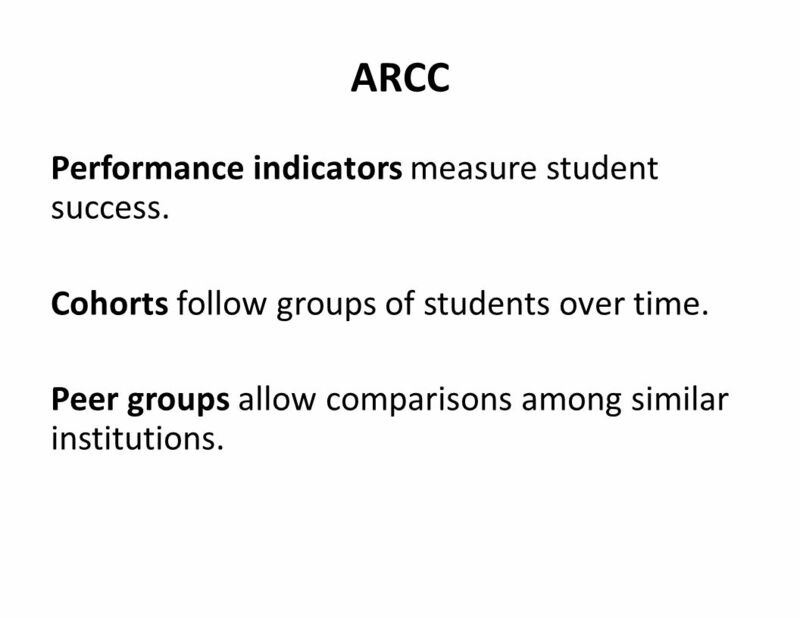 4 ARCC Performance indicators measure student success. 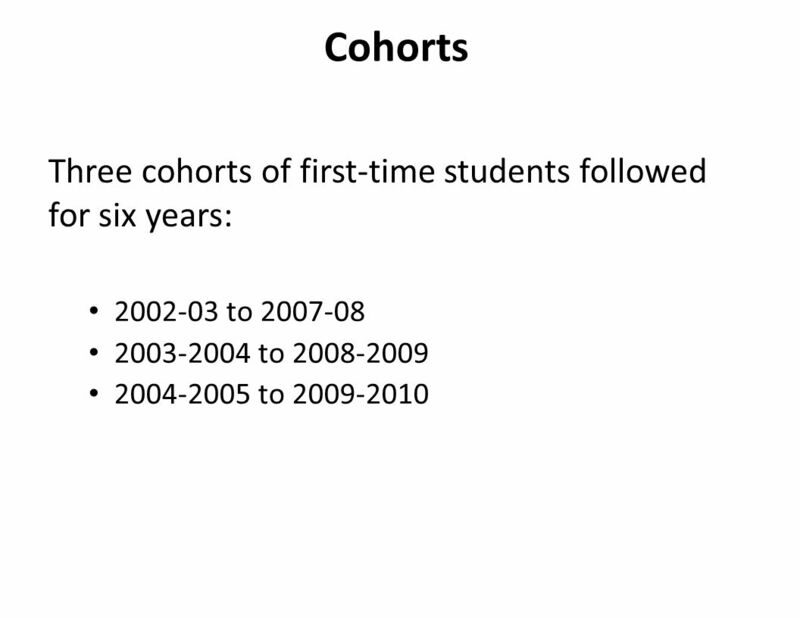 Cohorts follow groups of students over time. Peer groups allow comparisons among similar institutions. 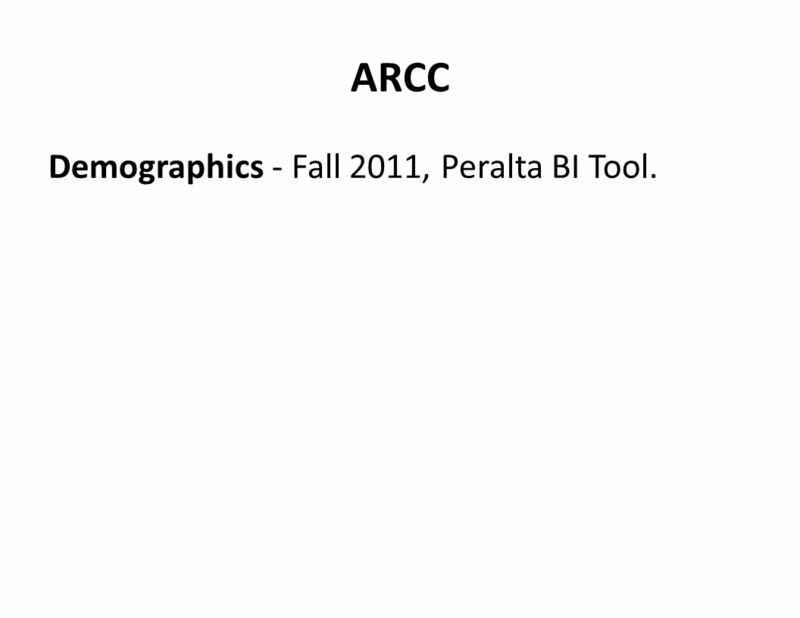 5 ARCC Demographics - Fall 2011, Peralta BI Tool. 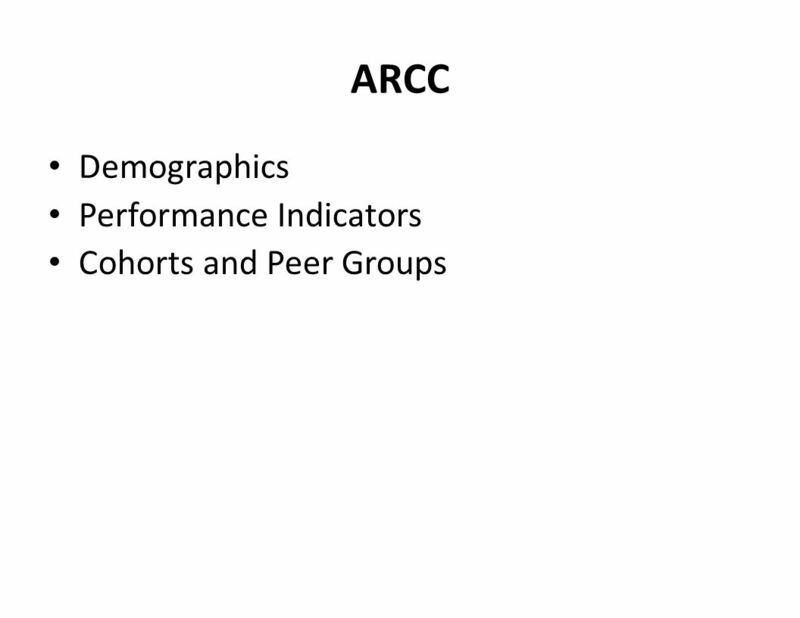 16 Peer Groups (similar colleges) Based on statistical analyses of demographic variables that correlate with performance indicators. Provide a basis for comparison of similar colleges. 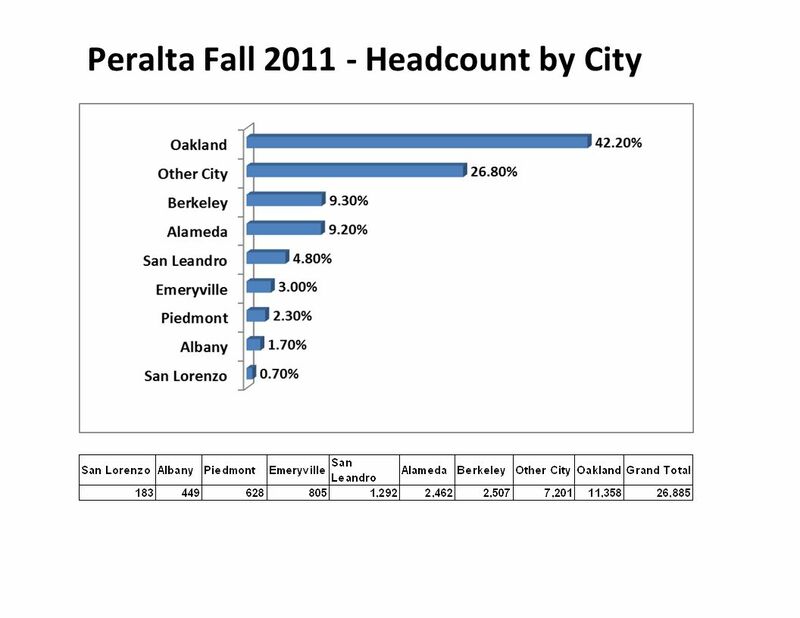 Peralta colleges generally (but not always) have the same peer groups. 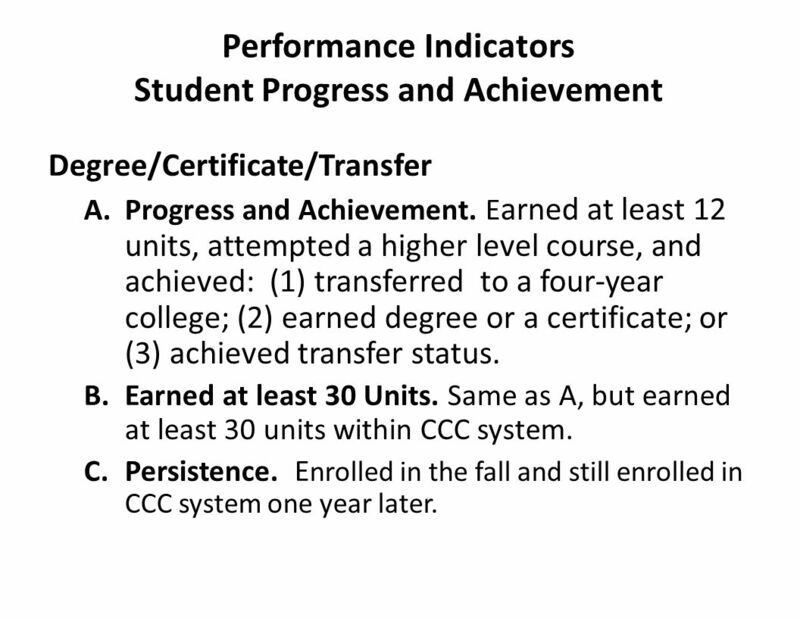 17 Performance Indicators Student Progress and Achievement Degree/Certificate/Transfer A.Progress and Achievement. E arned at least 12 units, attempted a higher level course, and achieved: (1) transferred to a four-year college; (2) earned degree or a certificate; or (3) achieved transfer status. B.Earned at least 30 Units. Same as A, but earned at least 30 units within CCC system. C.Persistence. E nrolled in the fall and still enrolled in CCC system one year later. 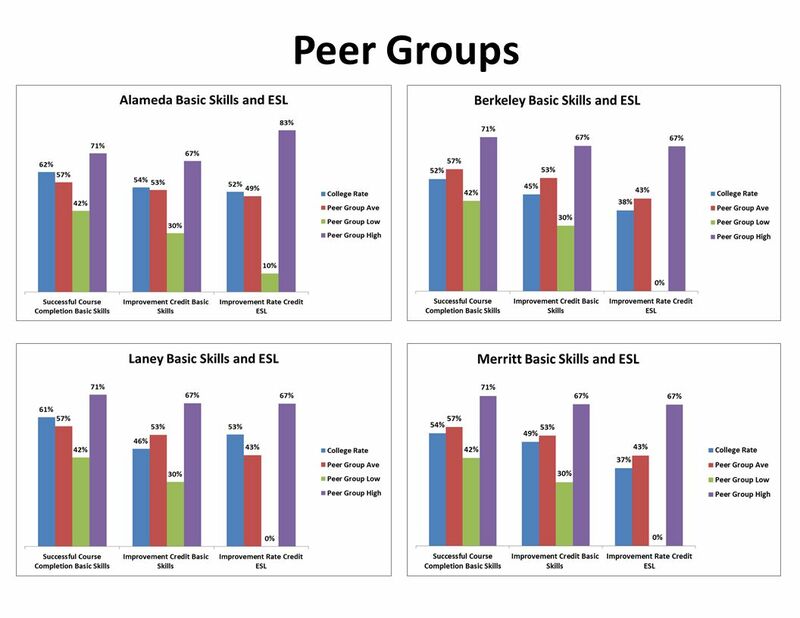 20 Peer Groups Summary Degree/Certificate/Transfer Alameda, Berkeley, and Laney higher than average in 2 out of 3 categories. Merritt close to top in 2 out of 3 categories. 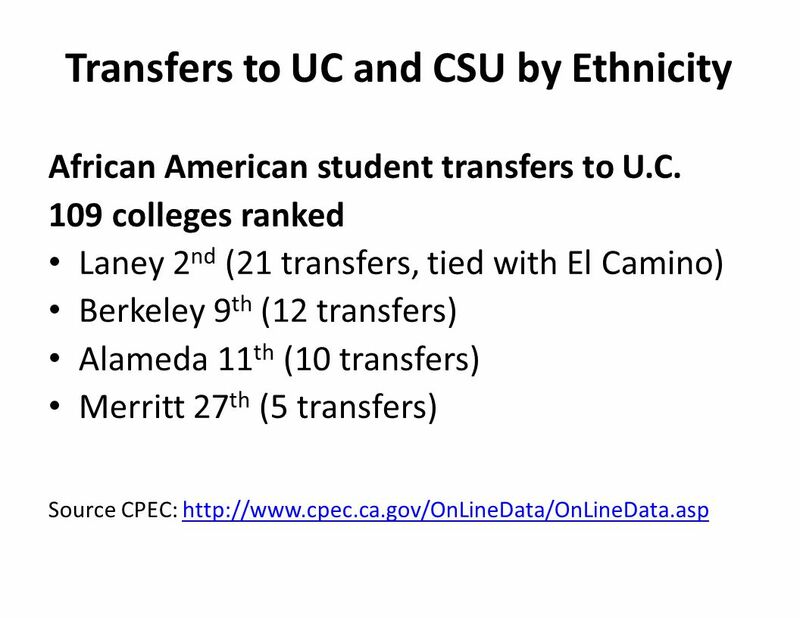 23 Transfers to UC and CSU by Ethnicity Disaggregated demographic data - not in ARCC Peralta ranks high in African American student transfers to U.C. and CSU (2009- 2010 data). 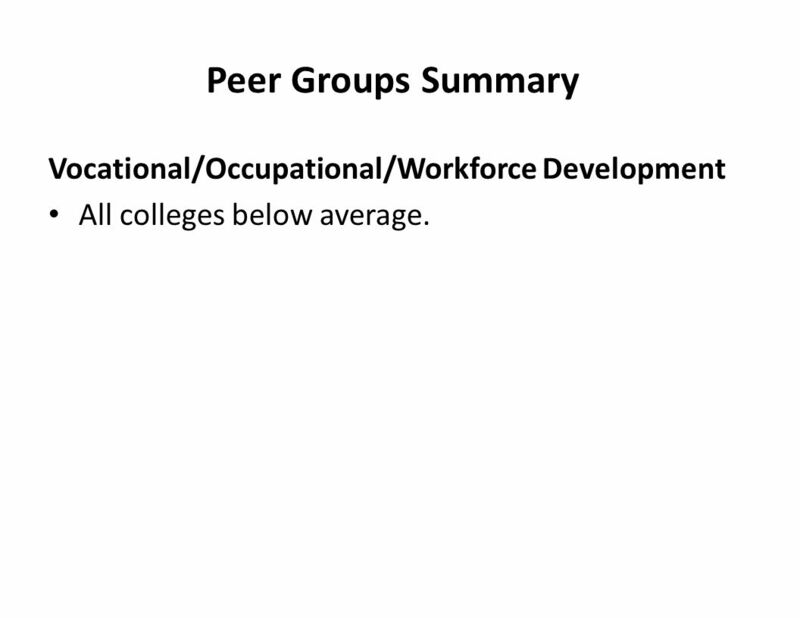 29 Peer Groups Summary Vocational/Occupational/Workforce Development All colleges below average. 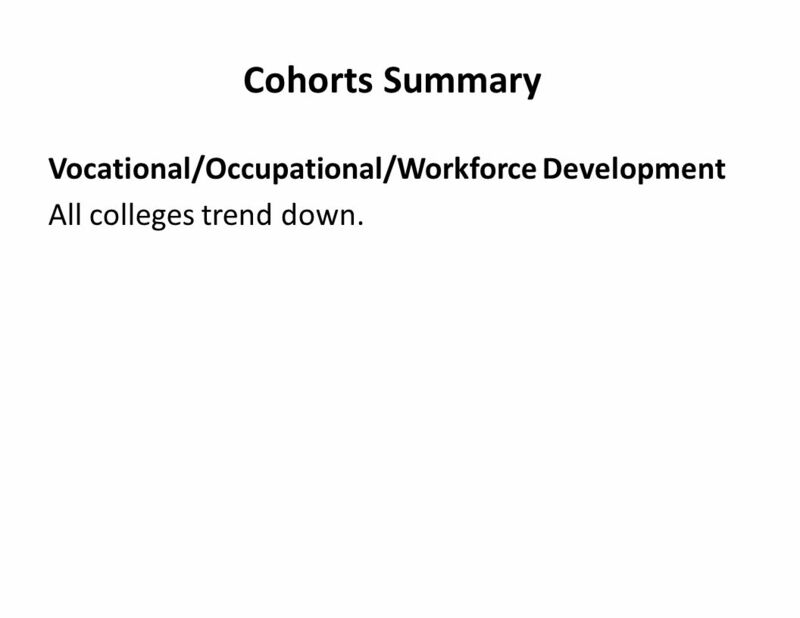 31 Cohorts Summary Vocational/Occupational/Workforce Development All colleges trend down. 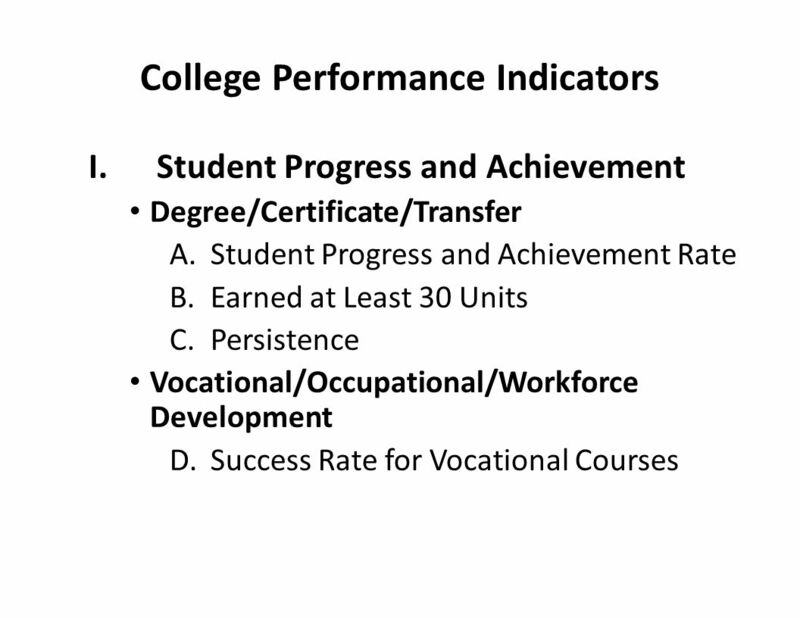 32 Performance Indicators Pre-Collegiate Improvement Basic Skills, ESL, Enhanced Noncredit E.Successful Course Completion Rate for Credit Basic Skills Courses. 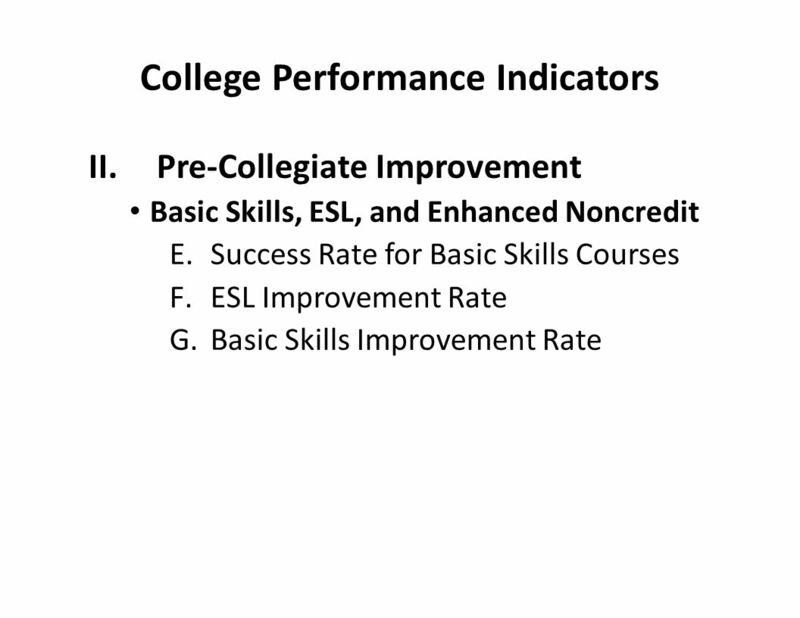 F.Improvement Rate for Credit Basic Skills Courses. 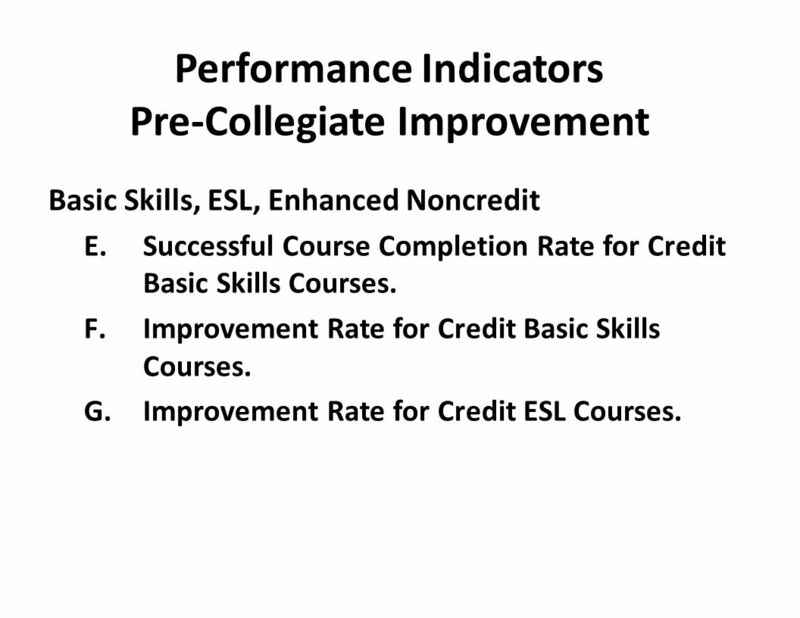 G.Improvement Rate for Credit ESL Courses. 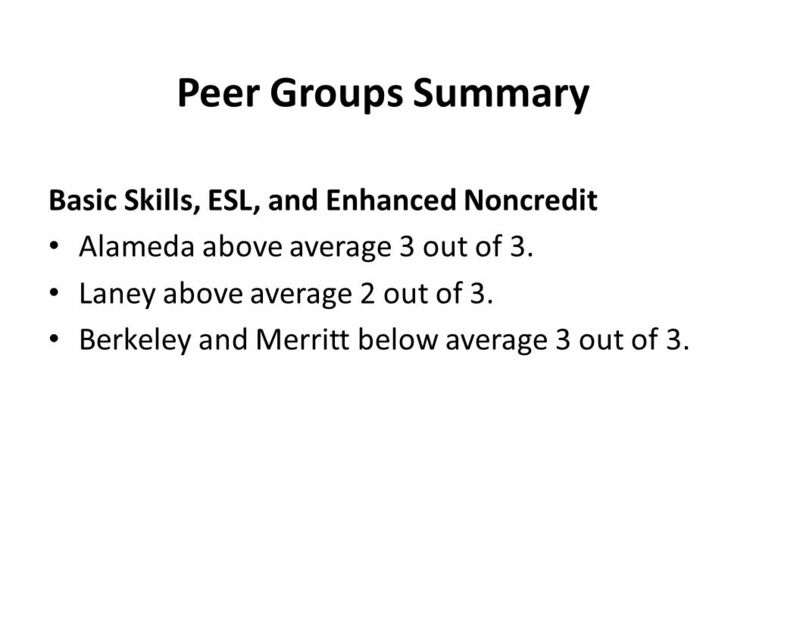 34 Peer Groups Summary Basic Skills, ESL, and Enhanced Noncredit Alameda above average 3 out of 3. Laney above average 2 out of 3. 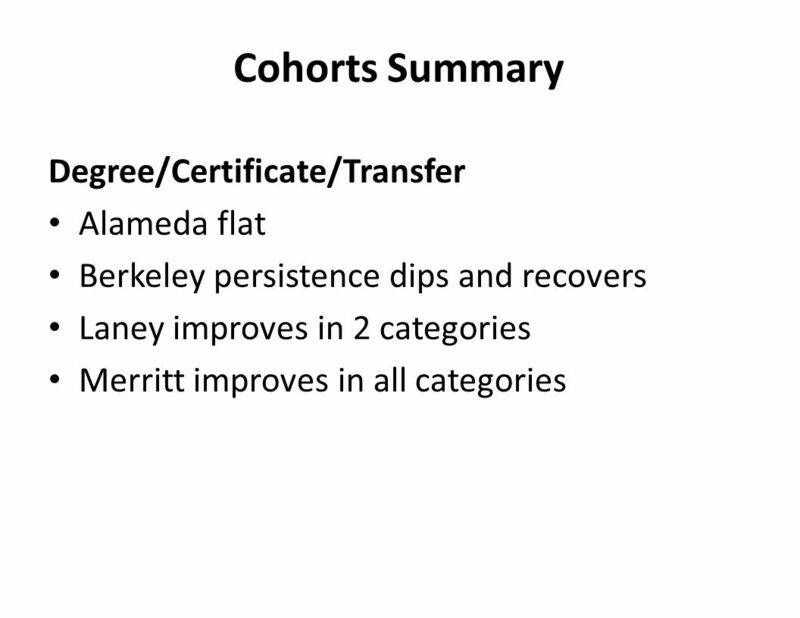 Berkeley and Merritt below average 3 out of 3. 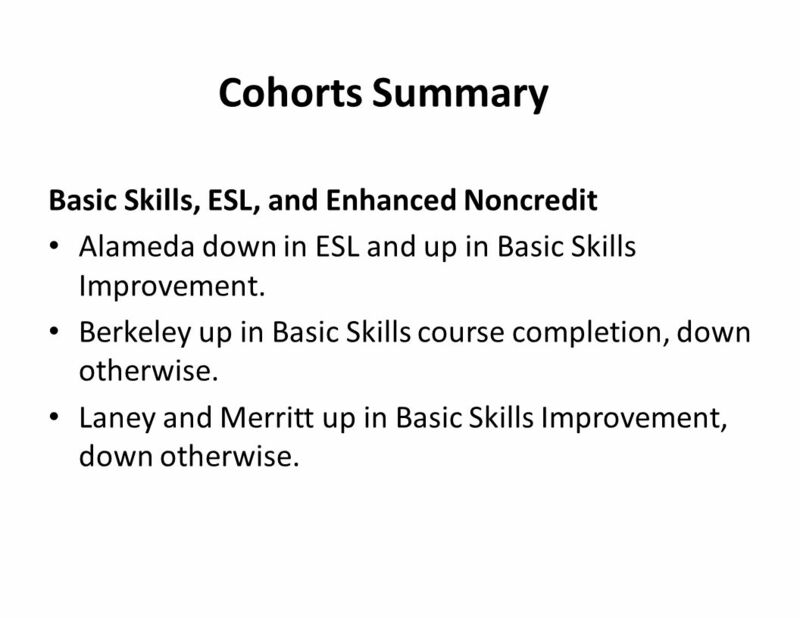 36 Cohorts Summary Basic Skills, ESL, and Enhanced Noncredit Alameda down in ESL and up in Basic Skills Improvement. 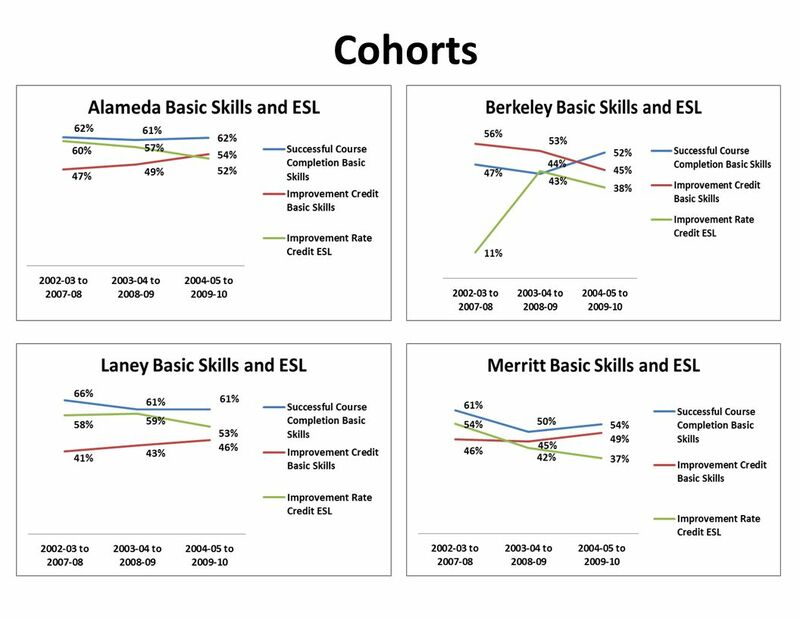 Berkeley up in Basic Skills course completion, down otherwise. Laney and Merritt up in Basic Skills Improvement, down otherwise. 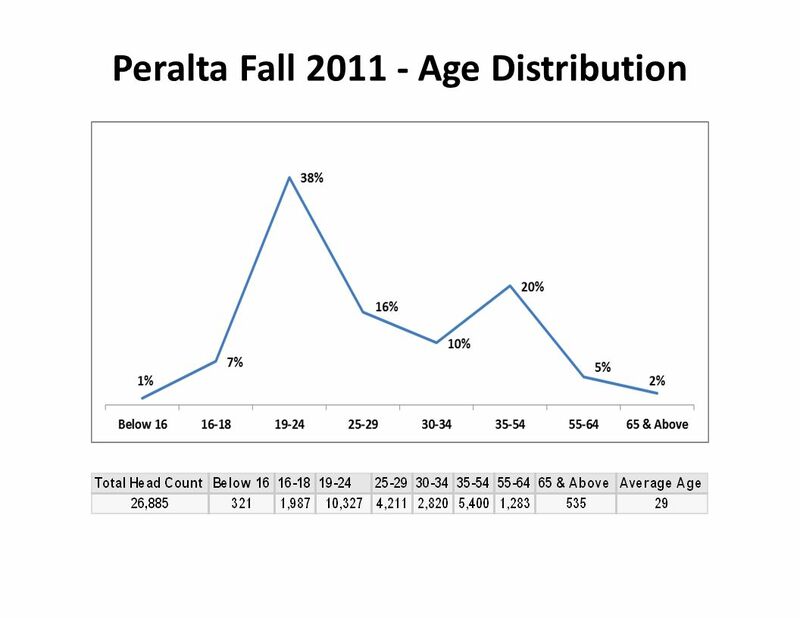 37 Conclusions Peralta Colleges typically above or close to average when compared to peers. Strong in degree/certificate/transfer. 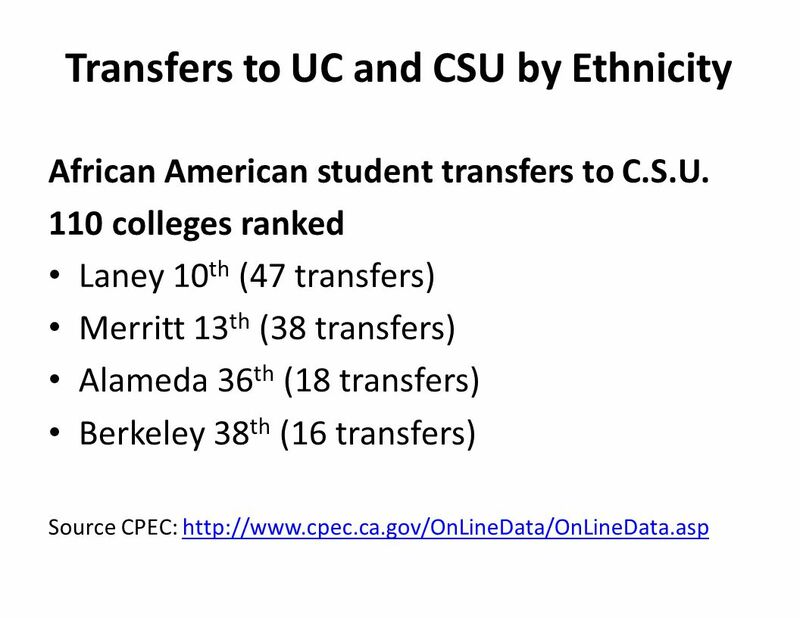 High in African American student transfers to UC and CSU. Need improvement in vocational successful course completion. Some issues system-wide. 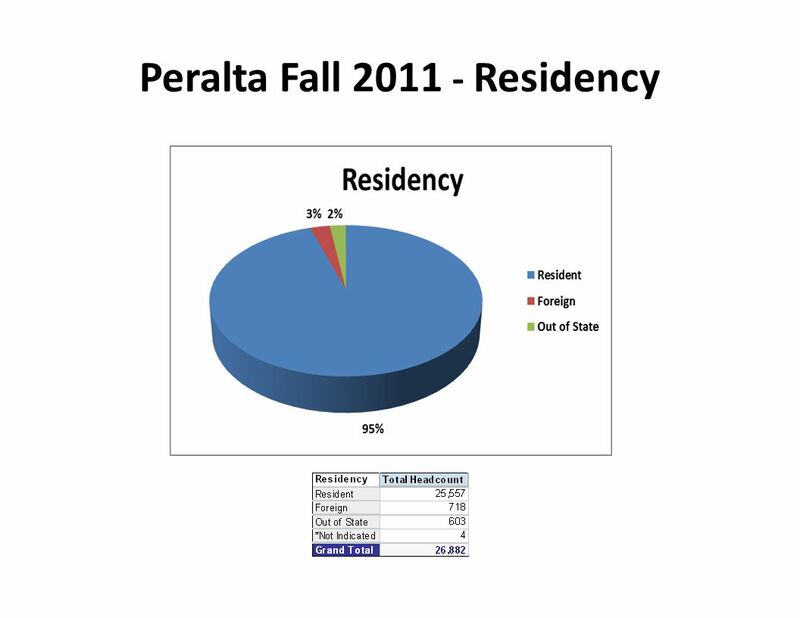 Download ppt "Peralta 2011 ARCC Report Mike Orkin, Ph.D. Office of Educational Services Peralta Community College District." DR. CHIALIN HSIEH DIRECTOR OF PLANNING, RESEARCH & INSTITUTIONAL EFFECTIVENESS APRIL 20, 2010 ARCC 2010 Report Accountability Reporting for the Community. 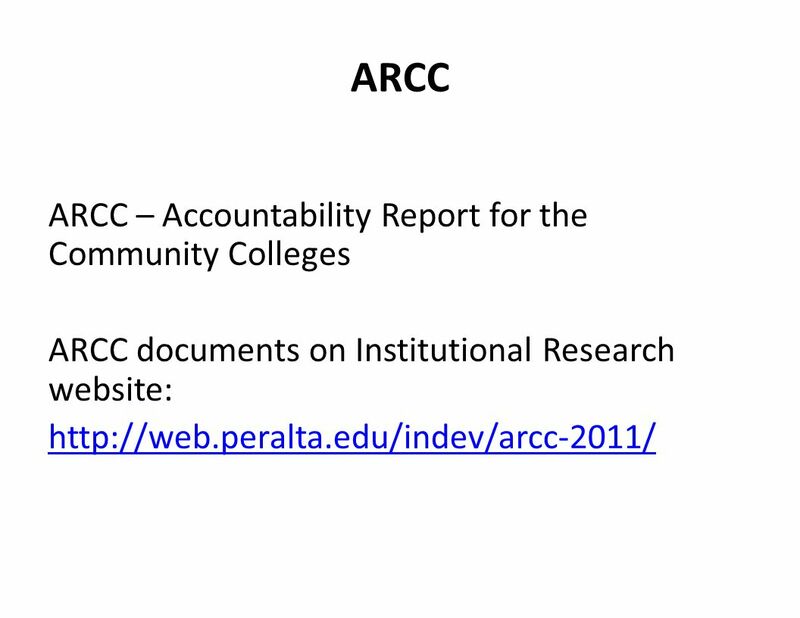 Accountability Report for Community Colleges AKA THE ARCC REPORT Released annually by the Chancellor’s Office 2.Set of seven College Performance. Success is what counts. 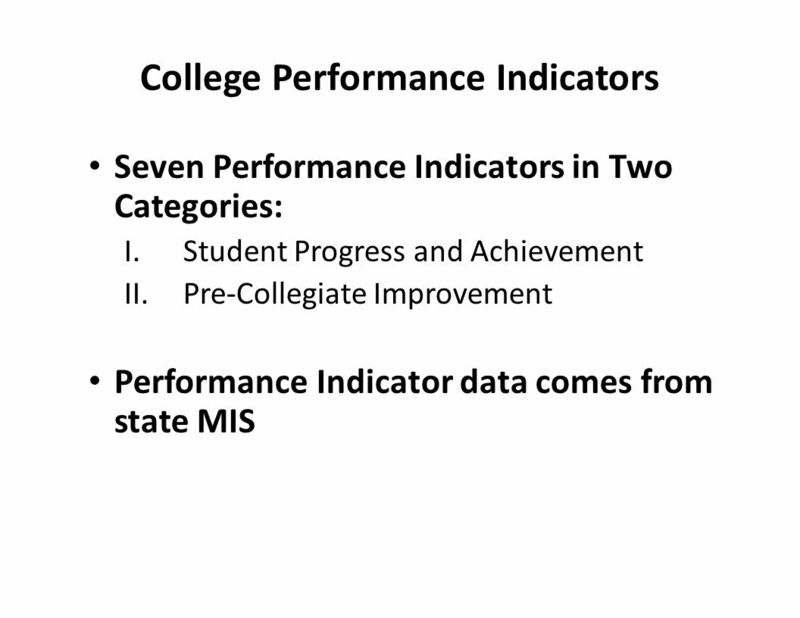 A Better Way to Measure Community College Performance Presentation about the ATD Cross-State Data Workgroup NC Community College. California Community Colleges Student Success 2014 Scorecard 2014 Scorecard College of the Desert Board of Trustee Presentation Dec. 19, 2014. Scorecard: How to Improve your CDCP Outcomes Rate Association for Community and Continuing Education 2014 Annual Conference Beverly Heasley Mt. San Antonio. Laney Community College Source: CalPass Plus data from Notes: The graph includes students who attended Laney College between fall 2008 and fall. Accountability Reporting for the Community Colleges 2010 Report: Moreno Valley College Calculation presented by presented by David Torres, Dean Institutional. STUDENT EQUITY PLAN PROGRESS PRESENTATION TO BOARD FEBRUARY 28, 2012. Preliminary Findings: Two-Four Year Transfer for CTE Students | 2009 | Dr. Darla Cooper, Associate Director and Eva Schiorring, Senior. The Voluntary Framework of Accountability for community colleges, by community colleges. Chabot College Students Fall 2007 Demographic, Educational & Psychographic Characteristics Dr. Carolyn Arnold Chabot College Institutional Research Office. 1 Demographic and Enrollment Information Office of the Chancellor Academic Affairs October 2006. + Our Student Today: Access, Equity, and Challenges Kevin Bontenbal - Cuesta College Dolores Davison - Foothill College Marcy Drummond - LA Trade Tech.  Student Success: What Is It, and How Can We Measure It? Kim Harrell, Folsom Lake College Carolyn Holcroft, Foothill College David Morse, ASCCC Executive. Educational Master Plan Data Associated Students of Foothill College (ASFC) May 28, 2015 E. Kuo FH IR&P. DVC is passionately committed to student learning through the intellectual, scientific, artistic, psychological, and ethical development of its diverse. 1 Office of Institutional Research and Planning The mission of the Foothill-De Anza Community College District Office of Institutional Research and Planning. 1 Foothill College Basic Skills College Hour Rob Johnstone, Ph.D. 10/8/03. SBVC Student Equity Plan A Update and Historical Overview James E. Smith, Ph.D. Dean, Research, Planning, and Institutional Effectiveness. 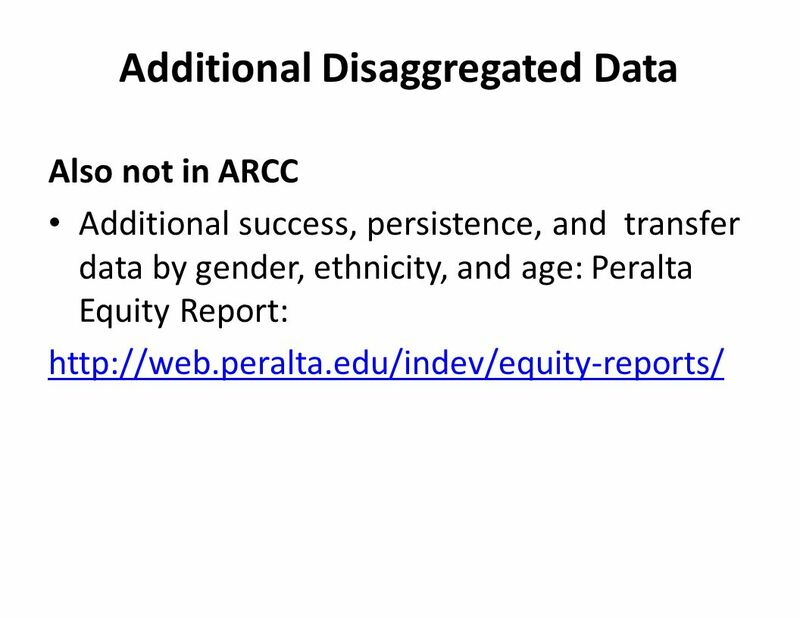 Academic Attainment in California Community Colleges: Racial And Ethnic Disparities in the ARCC 2.0/Scorecard Metrics Tom Leigh Alice van Ommeren. Preliminary Findings: Two-Four Year Transfer for CTE Students | 2009 | www.rpgroup.org Dr. Darla Cooper, Associate Director and Eva Schiorring, Senior.